The Courtyard by Marriott Vacaville is centrally located between Sacramento and San Francisco. We offer of 2,700 square feet of flexible meeting space including the areas only Executive Boardroom. We feature an outdoor Courtyard and Gazebo perfect for a lunch retreat, reception or wedding ceremony. We are the only Vacaville Hotel that offers full service, on-site catering and audio visual services. 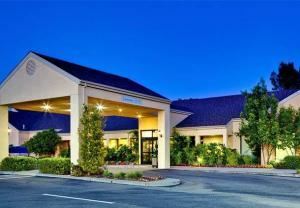 The Courtyard Vacaville is the largest hotel in Vacaville boasting 127 spacious guest rooms. The Courtyard Bistro - $150.00 Seats up to 40 guests. The space is perfect as a break out room. 1035 square feet Executive room - $450.00 (projection screen included) Seats up to 60 people, 70 people in theater style, 30 people in conference style and 60 people classroom style. 622 square feet Sierra or Tahoe room - $350.00 This room seats up to 30 people, 40 people in theater style, 20 people in conference style and 24 people in classroom style. 458 square feet Napa room - $250.00 This napa room can host events for 20 people seated, 20 people in theater style, 12 people in conference style and 18 people in classroom style. Please review our attachment for additional options. Special Features: Complimentary on-site parking, complimentary wi-fi throughout the hotel.